Farmers take the last cut of hay, and chestnut barrels are being washed and readied for the vendemmia, or grape harvest; up in the mountains lone figures search surreptitiously for elusive funghi porcini under the turning beeches. Once again it's autumn in the Marche, perhaps the loveliest of the seasons. Chefs from across Italy will be at Fano in mid-September for the eleventh annual Festival Internazionale del brodetto e delle zuppe di pesce, a celebration of the Marche's famous fish stew, and other forms of fish soup. The event takes place down at the Fano Lido from 12 to 15 September and looks set to be at its liveliest on the Saturday & Sunday. Even if fish stew doesn't stir your soul, a visit to this delightful and historic seaside town is always a pleasure. The majestic rocca in the heart of Senigallia provides the backdrop to the 13th annual festival dedicated to bread and bread-making in mid-September. Pane Nostrum runs for four days from 19 September, and includes stalls selling artisan breads from across Italy, demonstrations of bread making, tastings and even a section on "liquid bread" (better known as "beer"). Admission is free. This autumn sees the 13th annual Pergolesi Spontini Festival celebrating the Marche baroque composers Gaspare Spontini and Giovanni Battista Pergolesi. The event runs from 5 October until 3 November in Pergolesi's home town of Jesi and other nearby towns, and features a number of works by Verdi and Wagner to mark the bicentenary of their births. There's still time to catch a major exhibition of Baroque art at Osimo which runs until 15 December 2013. The show features the work of Rubens alongside paintings by other great artists working in the Marche in the late 16th and early 17th centuries, and takes place in the magnificent Palazzo Campana. This month's image of one of the region's piazze, or town squares, features the airy main piazza in Matelica in Ancona province. 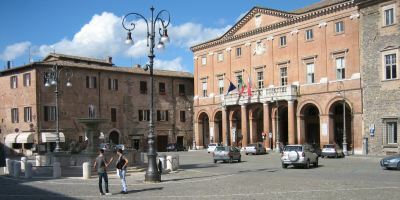 The town is celebrated for its own version of white verdicchio wine. The slopes of Monte Catria in the northern Marche are home to the region's very own breed of horse, the eponymous cavallo del Catria, a sturdy animal that roams free up in the mountains. The best way to get up close to these creatures is to visit the yearly horse fair at Cantiano which takes place on 12 and 13 October 2013, a jamboree of all things equine. There is little left of the 9th century Abbey of Rambona near Pollenza in Macerata province, but what remains is well worth hunting out. 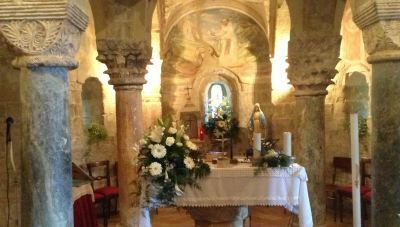 Decorated with an assortment of ancient carved capitals from the nearby Roman town of Pollentia, the crypt (see below) is one of the finest of its kind in the Marche. "This landmark publication" is how the UK's The Independent described it, while The Sunday Times dubbed it "a majestic edition" - just some of the universal praise that's been heaped on the first complete translation of Giacomo Leopardi's Zibaldone, the sprawling notebooks of the great Romantic poet from Recanati in the Marche. Running to over 2,500 pages, it's taken seven translators and two editors over seven years to produce, and has just been published by Penguin Classics in the UK, and Farrar, Straus and Giroux in the US. The number of Russian tourists visiting the Marche increased by over 16 percent in just the first six months of 2013.